I look to two of my favorite go-to writers for inspiration as 2016 draws to a close and we move into 2017. This link will take you to more from Parker Palmer about how he will engage the new year, as well as the rest of Howard Thurman’s explanation of “the growing edge” of life. Indeed, it is often the little things we do, perhaps without forethought, that make a difference. A few days ago another Facebook acquaintance posted a lovely sentiment about how much she enjoys seeing decorated holiday trees from outside. That reminded me of a story I hadn’t thought about in a long time. One Christmas long ago, very unexpectedly and for no particular reason, I placed a small pre-lit tree, hung with all our angel ornaments, in an upstairs bedroom window where I thought of it as being just for us as we passed through the nearby hallway…definitely not a spot for public consumption. I learned later that the next-door neighbor’s master bedroom faced out toward that tree…it was the holiday season her husband learned he had cancer and the tree had become a source of comfort to them every night as they retired to their bedroom. She was quite taken to learn a few weeks into the season that the tree was laden with angels, which she said she felt were placed there especially for them! 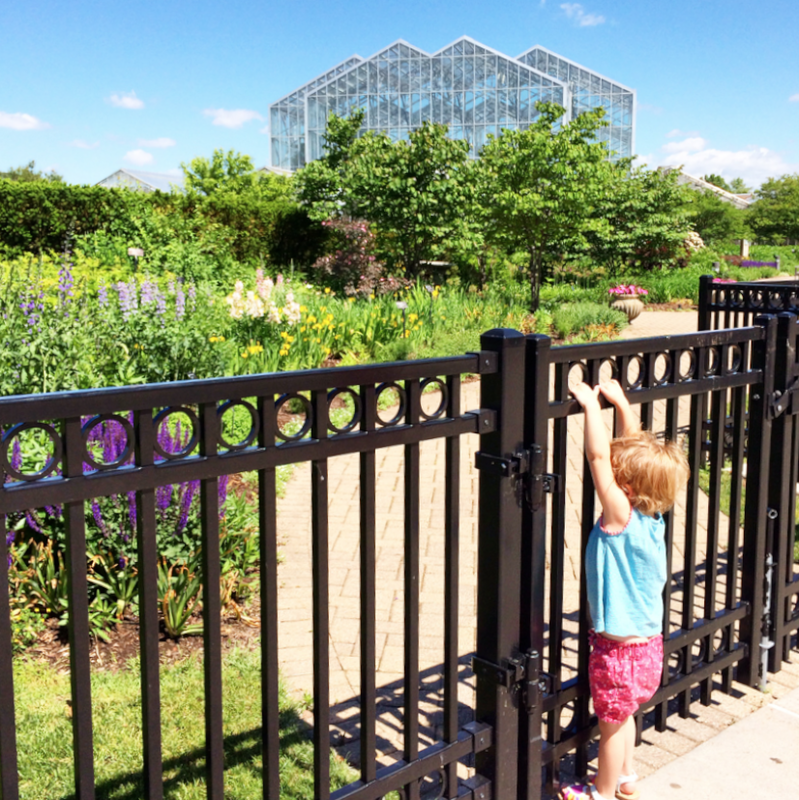 The picture at the top of this blog post features our youngest granddaughter looking onto the grounds from outside the gates of the Frederik Meijer Gardens and Sculpture Park in Grand Rapids. One recipient of our end-of-year video, which included this photo, said, “The slide that hit me the most was one of your granddaughter holding the bars of a gate with a big house beyond. It symbolized so many things for me….the picture is haunting.” I hadn’t thought of the photo in the way it struck that viewer, but it wasn’t hard to catch her meaning. As we stand on the threshold of a new year with many unknowns, where does this photo take you? 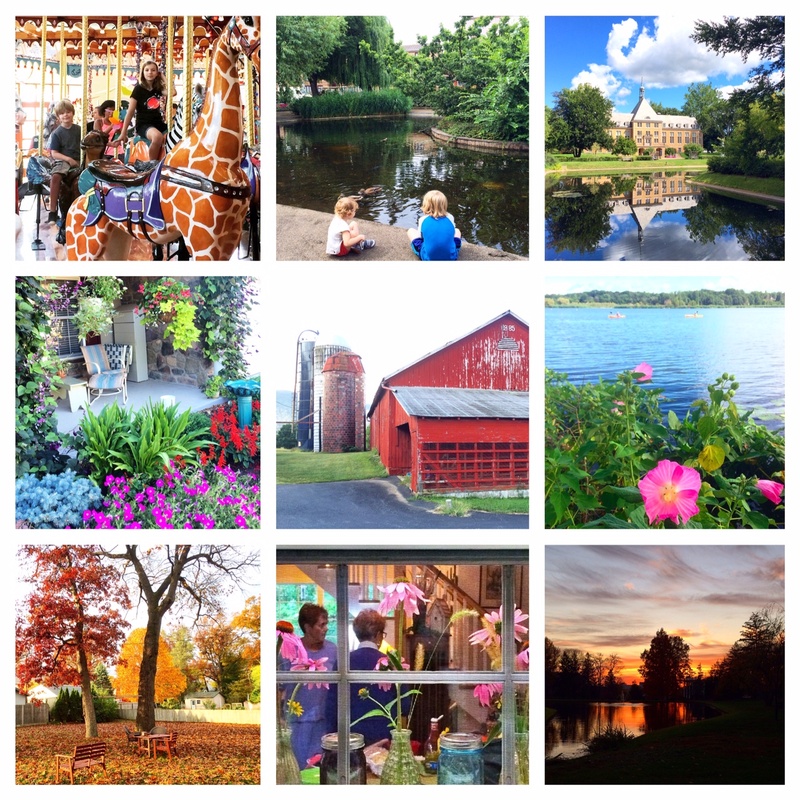 The nine photos posted as one at the conclusion of this entry represent good memories from 2016. To select these nine, I focused largely on spaces that were sanctuary for me in a year of upheaval around the world and in our own country. Within that crazy, noisy world, I found quiet spots of beauty and respite, gifts from the Divine that offered balance in chaos for me (from left to right and top to bottom): with local grandkids on a carousel in St. Joe, MI; with Michigan grandkids at Clapton Pond in London; on the Saint Mary’s campus with high school friends; admiring the front porch sanctuary of long-time friends in Lansdale, PA; with a KRMC friend taking in the beauty of her mom’s barn in Everett, PA; viewing with golf foursome women the glorious waterfront in Douglas, MI; enjoying my own backyard in South Bend; inhaling warmth through the window with small group friends at Grandpa’s Woods in Goshen, and appreciating the glory of a sunset overlooking my high school’s memorial garden in Lansdale, PA.